Yesterday was a day for tearful press conferences in Osaka. 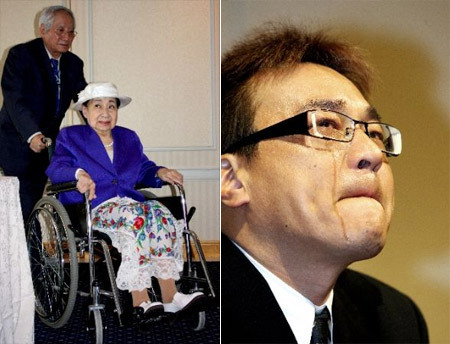 Veteran actress Kyou Utako (81) was allowed out of hospital to talk to reporters at a hotel in the city. She cried as she explained how medical problems have forced her to drop out of a production at the Osaka Shochikuza theater next month and cancel all work commitments from June. “I’ve been in show business for 64 years and I never dreamed it would come to this.” Experiencing leg pains in January, she had an MRI which revealed she had a fractured vertebra. She was told that it would heal in a couple of months, and she continued working with the help of a corset. But earlier this month her pain returned and she was told that she had developed a condition known as degenerative spondylolisthesis in two other vertebrae. Though she was told it will take at least three months to heal, she took to the stage in a wheelchair for a one-week production at the Meijiza Theater in Tokyo last week. Doctors had to force her not appear on the closing night last Saturday. “I love the stage,” she said. “I’ve often said I’d like to die on stage, and really that would be the happiest way for me to go. But I suppose I have to look after my health.” Kyou is perhaps best known for her role in the long-running TBS drama series “Wataruseken wa Oni Bakari.” In the late 1950’s she formed a popular manzai comedy duo with her former husband Ootori Keisuke (1923-94), and the duo were inducted into a showbiz hall of fame just last year. Meanwhile, popular talento Kitano Makoto (50) gave a press conference at the Westin Hotel in Osaka to apologize for the verbal gaffes that may yet end his career. Long known as a straight talker, he has a history of upsetting people with the things he says on his radio show. He bowed repeatedly to reporters and said that he had allowed his image as a “dokusetsu” (poison tongue) talento to become his “curse.” Neither Kitano nor his Shochiku Geino management have clarified exactly what he said that caused the latest uproar, but they denied Internet rumors that his target had been either a certain religious organization or show business management agency (the strongly politically affiliated Soka Gakkai organization is sometimes referred to as a cult, while the Burning agency is said to be a front for the yakuza). Kitano was in tears as he talked about his family and how he had asked them to be patient with him until he got his career back on track. He has been dropped from all his regular radio and TV shows, the last one having been broadcast on Monday. His forced sabbatical is open-ended but he insisted yesterday that he doesn’t want to quit show business and will aim to get back on the air someday. • Among those recognized by the government this spring for their contributions to society and the arts are veteran actresses Mizutani Yaeko (70) and Asaka Mitsuyo (81) and Hollywood legend Clint Eastwood (78). The Emperor and Prime Minister will present the various decorations at the Imperial Palace in Tokyo on May 8. Mizutani will receive the Order of the Sacred Treasure, Gold Rays with Rosette; Asaka gets the Order of the Rising Sun, Gold and Silver Rays; and among the 70 overseas recipients, FIFA president Sepp Blatter (73) is to receive the Grand Cordon of the Order of the Rising Sun, while Eastwood will get the Order of the Rising Sun, Gold Rays with Neck Ribbon.